This entry was posted in Year 3 TDIWH and tagged Abel Wolman, Abel Wolman Award, AWWA, Baltimore, Boonton Reservoir, Charles F. Wallace, chlorine, drinking water, gas chlorinator, Jersey City, Martin F. Tiernan, Maryland, New Jersey, Rockaway River, The Chorine Revolution, Wallace & Tiernan, water, water history, water supply on February 22, 2015 by safedrinkingwaterdotcom. February 22, 1913: 100 Years of chlorination by Wallace & Tiernan. The company’s first gas-feed chlorinator, an experimental apparatus, was installed on a tributary of the Rockaway River at Dover, New Jersey, on February 22, 1913. 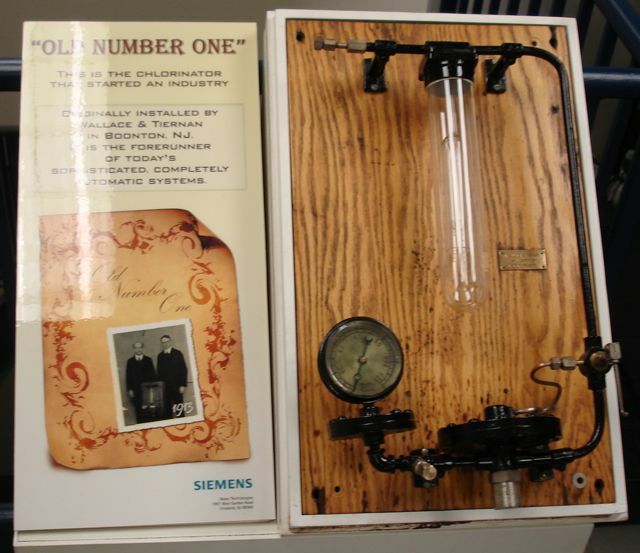 Wallace & Tiernan was the dominant producer of chlorination equipment in the first decades of the twentieth century. Wallace & Tiernan were first founded in New York City, but shortly thereafter, they moved their administrative and manufacturing operations to Belleville, New Jersey. There were many connections between the early days of Wallace & Tiernan and the Jersey City water supply. William Griffin, superintendent of the Jersey City water department, hired Charles F. Wallace and Martin F. Tiernan to disinfect the polluted stream near Dover that was contaminating the Rockaway River as it flowed into Boonton Reservoir. Two of the expert witness in the Jersey City trials, Charles E. North and Earle B. Phelps, hired the two men in the very beginning of their careers to help install disinfection systems in cities as part of North and Phelps’s consulting practice. Tiernan actually ran the chloride of lime feed system at Boonton Reservoir in the early fall of 1912 when the chemist was on vacation. February 22, 1989: Abel Wolman dies. “Abel Wolman (June 10, 1892 – February 22, 1989) was an American inventor, scientist, professor and pioneer of modern sanitary engineering. Wolman was born, grew up, was educated, lived and died in Baltimore, Maryland. He graduated from the Baltimore City College in 1909, got a B.A. from the Johns Hopkins University in 1913 and then a B.S. in engineering from Hopkins in 1915. From 1914 to 1939, Wolman worked for the Maryland State Department of Health, serving as Chief Engineer from 1922 to 1939. It was during his early years there that he made his most important contribution. Working in cooperation with chemist Linn Enslow, he standardized the methods used to chlorinate Baltimore’s drinking-water supply. His efforts there helped develop the plan for Baltimore’s water supply so thoroughly and effectively that it remains well-provided for growth through the 21st century. His work also benefited water systems in New York, Detroit and Columbus, Ohio. A collection of his writings has been published: Water, Health and Society, Selected Papers. 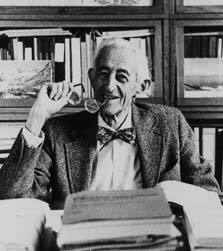 Wolman served as the Chairman of the Advisory Council for planning Israel’s National Water Carrier project (1950-1956). This entry was posted in This Day in Water History and tagged Abel Wolman, Abel Wolman Award, AWWA, Baltimore, Boonton Reservoir, Charles F. Wallace, chlorine, drinking water, gas chlorinator, Jersey City, Martin F. Tiernan, Maryland, New Jersey, Rockaway River, The Chorine Revolution, Wallace & Tiernan, water, water history, water supply on February 22, 2013 by safedrinkingwaterdotcom.